Over the past five years, more Americans of all ages are rolling out their yoga mats and meditating. 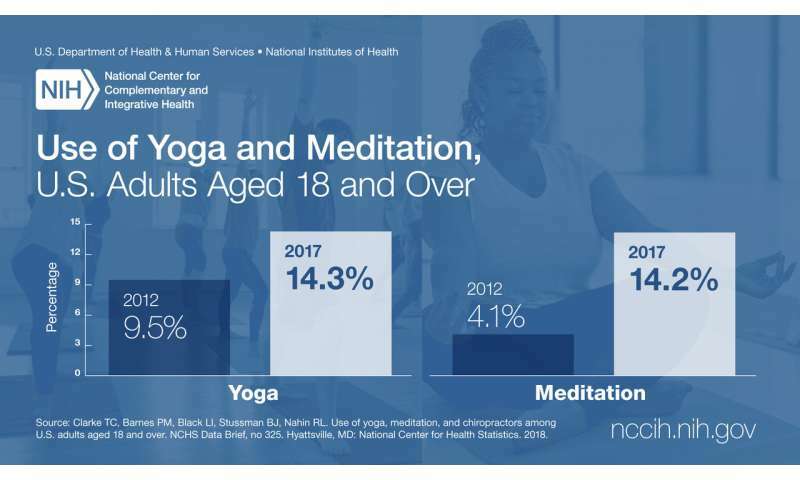 A large nationally representative survey shows that the number of American adults and children using yoga and meditation has significantly increased over previous years and that use of chiropractic care has increased modestly for adults and held steady for children. The complementary health questionnaire was developed by the National Center for Complementary and Integrative Health (NCCIH), part of the National Institutes of Health, and by the Centers for Disease Control and Prevention's National Center for Health Statistics (NCHS). The complementary health questionnaire is administered every five years as part of the National Health Interview Survey (NHIS), an annual study in which thousands of Americans are interviewed about their health- and illness-related experiences. To identify trends in Americans' use of specific practices, 2017 survey data were compared with a version of the survey fielded in 2012. "The 2017 NHIS survey is the most current and reliable source of information on the use of specific complementary health approaches by U.S. adults and children. The survey data suggest that more people are turning to mind and body approaches than ever before, and the research we support at NCCIH is helping to determine the impact of those approaches on health," said David Shurtleff, Ph.D., Acting Director of NCCIH. Yoga was the most commonly used complementary health approach among U.S. adults in 2012 (9.5 percent) and 2017 (14.3 percent). The use of meditation increased more than threefold from 4.1 percent in 2012 to 14.2 percent in 2017. The use of chiropractors increased from 9.1 percent in 2012 to 10.3 percent in 2017. In 2017, women were more likely to use yoga, meditation, and chiropractors in the past 12 months than men. Non-Hispanic white adults were more likely to use yoga, meditation, and chiropractors than Hispanic and non-Hispanic black adults. The percentage of children aged 4-17 years who used yoga in the past 12 months increased significantly from 3.1 percent in 2012 to 8.4 percent in 2017. Meditation increased significantly from 0.6 percent in 2012 to 5.4 percent in 2017. There was no statistically significant difference in the use of a chiropractor between 2012 and 2017 (3.5 percent and 3.4 percent, respectively). In 2017, girls were more likely to have used yoga during the past 12 months than boys. In 2017, older children (aged 12-17 years) were more likely to have used meditation and a chiropractor in the past 12 months than younger children (aged 4-11 years). Non-Hispanic white children were more likely to have used yoga and a chiropractor in the past 12 months than non-Hispanic black children or Hispanic children. Information on the use of complementary health approaches was collected from a sample of adults aged 18 and over who answered the 2012 (n=34,525) and 2017 (n=26,742) NHIS adult alternative medicine or complementary health questionnaires, respectively, and from respondents of sample children aged 4-17 as part of the Child Alternative Medicine (2012) or Child Complementary Health (2017) supplements of NHIS. The percentage of adults who saw a chiropractor in the past 12 months was obtained from the Adult Access to Health Care and Utilization (AAU) section of the sample adult core questionnaire for both years. It is interesting that in the USA women practice more yoga and meditation, but it seems that in India are men those who practice more yoga and meditation, I have no data about India, but I did not have data about the USA and before I read this study I had the idea that in the Western societies women are more likely to do yoga and meditation.